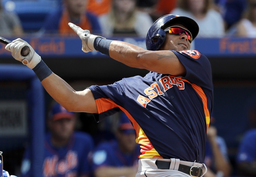 PORT ST. LUCIE, Fla. (AP) After spending his entire career with the Cleveland Indians, Michael Brantley likened joining the Houston Astros to going to a new high school. Those first day butterflies quickly dissipated, and the outfielder is fitting in famously with his new teammates. He has already moved into a leadership role on this veteran team. "One of the best things about this locker room is when I came in, everybody was willing to help and make me feel comfortable and talk," he said. "You come in every morning, you look around and everybody's smiling and playing cards, and it's just a great atmosphere all-around that they created." The free agent outfielder signed a $32 million, two-year contract with Houston in December after spending his first 10 seasons with the Indians. Manager AJ Hinch has admired Brantley and is just as impressed after seeing him up close for the past couple of weeks. "He fits in perfectly," Hinch said. "He could walk in all 30 clubhouses and immediately garner the respect that he deserves. He's very professional. He's very consistent." Houston wasn't lacking in veteran leadership with a team which includes Jose Altuve, George Springer, Josh Reddick and Yuli Gurriel. Brantley has still managed to make a mark. "He's quickly become a very important person in our clubhouse," Hinch said. "He's someone I know our position players will look up to or will look to when it comes to maintaining the balance that it takes to be a position player for us." The career .295 hitter gives the Astros an upgrade to an outfield anchored by Springer and adds a left-handed bat to a predominantly right-handed lineup. He's enjoyed camp so far and used it as a chance to bond with his new teammates on and off the field. "The whole goal of spring training is developing a relationship with your teammates and getting comfortable with reads and breaks and just getting back into baseball shape," he said. "But also learning what the guy wants next to you and learning how you can help and what you can do to make your teammates better." The three-time All-Star hit .309 with 17 homers, 36 doubles and 76 RBIs in 143 games last season, making 134 starts in left field. His best season came in 2014, when he finished third in AL MVP voting after hitting 20 homers with 97 RBIs - both career highs. He's excited about the possibility of helping the Astros win another World Series after they took their first title in 2017. And with the group of guys he's joining, he will be careful to simply be himself instead of trying to do too much to wow his new teammates. "You know how good everybody is in this locker room so I'm just going to come in and try to do exactly what I'm doing, and if that helps the team win games that's all I care about," he said.